NCERT social science textbooks will bear the brunt of govt bid to ease study burden for school students. No major cuts expected in science or math. New Delhi: A chapter on the history of cricket in the Class IX social science curriculum is among the content likely to go as the government looks to purge NCERT books of unnecessary material to cut the study burden of school students. Social science textbooks, sources said, would bear the bulk of the cuts, with those for mathematics, science and the languages unlikely to change much. The changes will kick in from the new academic year. “Social science will have more cuts than science, mathematics and languages,” said an NCERT source familiar with the developments. “For example, there is a chapter on the history of cricket in Class IX social science books, which is totally unnecessary,” the source added. “Things like that will be removed from the syllabus. “Science, mathematics and the languages do not need much reduction, just some pruning of content here and there,” the source said. “The science syllabus for higher classes like Class XI and XII especially does not need any reduction because that is a level at which students need more study material,” the source added. “It is also the level when they want to prepare for competitive exams like the Joint Entrance Examination (JEE) for engineering and the National Eligibility Entrance Test (NEET) for medicine, and NCERT textbooks are helpful for that,” the source said. 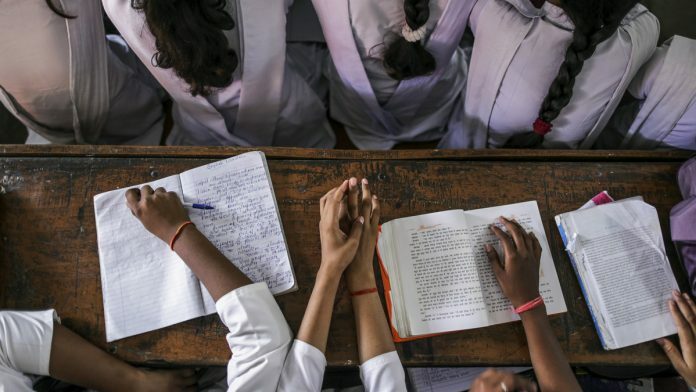 Union Human Resource Development Minister Prakash Javadekar had announced earlier this year that the content of National Council for Educational Research and Training (NCERT) books being taught in schools will be reduced by half in the coming years to ease the burden on students. Following the announcement, the NCERT constituted a committee to work out where and how the syllabus can be cut, and the panel has now submitted its report to the council. Sources in the NCERT say that while it is not possible to reduce the syllabus by half, they are working on reducing portions wherever possible. For the exercise, the HRD ministry had also invited suggestions from the public, with everyone from parents to teachers, and even people interested in the field of education, encouraged to weigh in. The government received more than one lakh suggestions. According to sources, while a large number of people said the syllabus should be reduced by 50 per cent, many others suggested a calculated approach not driven by this target. Some people, meanwhile, suggested increasing the syllabus in some of the subjects, especially science, to bring it on a par with international standards, the sources said. The NCERT is now studying the suggestions of the panel as well as the public to finalise the cuts. A comparison of the syllabus for the Council for the Indian School Certificate Examinations (ICSE), which includes some NCERT books, and that of the Central Board of Secondary Education (CBSE), where they form the bulk of the curriculum, shows that the latter is anyway lighter.